Welcome to the eCommerce app, a powerful app that allows you to fully setup a store on your website in less than an hour. Here and now, you’ll find loads of options to customize your storefront completely to create the perfect online shop for your business. Get started by adding product names, prices and pictures. Go for 'More powerful options' to add other product attributes (categories, weight, description, color) or in case you would like to upload your product catalog to your store. You can even set SEO tags, set the product Availability and manage the Stock Control. Hit + Add more to add new products. Guess what? There is an option to Duplicate the product as well. The next step is verifying the Geo settings. Here you can review country, currency and weight settings for your store. Press the 'Edit' button to change these settings. To edit the details, go to Formats & Units settings. Once you’re done here, set your company info that will be used in customer invoices, email notifications and for calculating shipping rates. Don’t forget to hit ‘Save’ when you’re all set. What about moving forward exploring the eCommerce Left Panel? As you can see, it's empty now but it will get filled soon once you've made your first sales. Catalog - The 'Catalog' section is all about your Products and Categories. That's where you can manage them in one place. Browsing your product catalog is more eye-catching for your customers when they find unified descriptions on every product page. That makes it easier to compare products and visually improves the overall look of the page. Just click on a single product to edit and customize the already existing product the way you want. You can manage categories, add subcategories or delete them the same effortless way. Choose a category on the left, change the name, storefront image and add more products from 'Category Products'. Discount - Are you looking for the best marketing strategy that can get you lots of customers into your eCommerce store? Here’s where ‘Discount’ section comes in handy. It allows you to create Discount Coupons and Discounts based on Subtotal, Customer Groups or Customer Groups and Subtotals. All Sales Channels - ‘All Sales Channels’ includes advanced options like listing your products on some of the most popular shopping websites, exporting your products to eBay or managing your store from your mobile device. Reach millions of customers by unlocking additional sales channels. Maximize your sales and drive more traffic to your store by listing your products on the most popular shopping sites on the Internet such as Amazon, eBay, Yahoo, Nextag, Shopzilla, Yandex, Market and more. Payments - It's high time to set up your preferred payment option. Ucraft is integrated with loads of payment providers like PayPal, Authorize.Net or First Data to make online purchase in your store fast and easy. If you are new to selling online, the quickest way to accept payments is to attach your PayPal account to your store. Go for Choose Payment Processor for more progressive settings. Here you can find the list of all payment gateways available for your country as well as other payment gateways which are available worldwide. For instance, PayPal Standard and Express Checkout, Paypal Advanced and PayPal Payflow Link, PayPal Payments Pro Hosted, PayPal Bill Me Later among the available payment options. !Note: System generates the Payment channels according to the Country you've chosen when setting up your online store, et. in case you've registered your eCommerce website mentioning UK as your country, you'll get the methods available in UK. Scroll down to see all the methods. Make use of your email attached to your account to receive the payments or change it instantly. Shipping - Your sale will be incomplete without shipping. Before you start selling, you need to decide what shipping methods you want to use, and then set up shipping on your store. For that purpose ‘Shipping & Pickup’ section can be advantageous. Just so you know, there are 8 Shipping methods available in our eCommerce App atm. And finally, but not list important, your store 'Settings', where you have pretty much everything within a hand's reach to set your powerful and functional eCommerce website. This includes closing your storefront for maintenance, managing the General settings, Currency, Weight & Size, Storefront Languages, Date & Time and much more. Check out the 'Cart' tab for Catalog Settings, enabling 'Compare to' price or Order Comments and loads of other handy stuff you'll definitely need when maintaining the Checkout process. 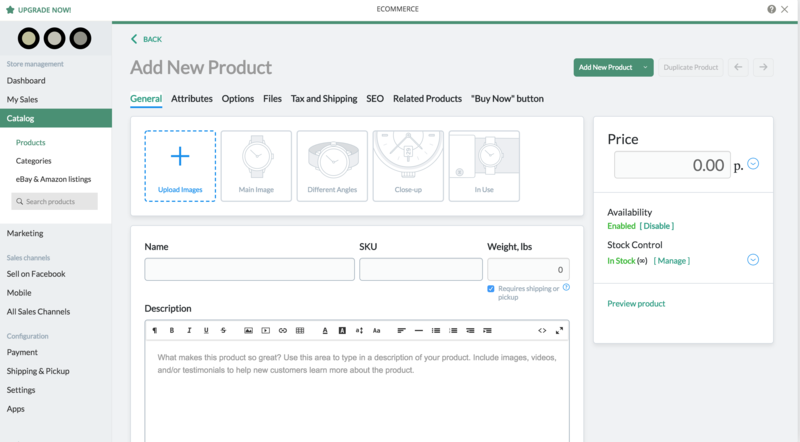 Buttoned up, now you can move to your Edit Mode to add eCommerce Elements to your storefront! But wait, as you're reading this, our enthusiastic team is already working on enhancing your experience as a shop owner! So don't waste your time and make the most out of this app to create a powerful, yet beautiful online store. Want to attract more buyers with limited budget? Check out this cool article with some amazing hacks! Always know we're just a step away so hit the Chat box in the lower right corner if you have any questions!